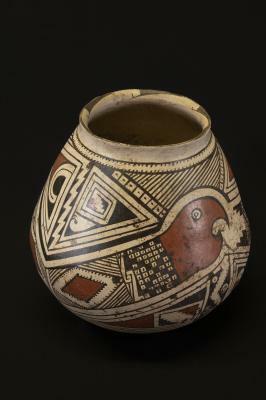 This jar from the Casas Grandes region exhibits large images of two macaw (parrot) figures as well as many other parrot figures and designs, illustrating the importance of these birds to cultures of northern Mexico and beyond. This vessel was painted by a master artist and dates to 1350 A.D. Demonstrations include a turkey feather blanket making demo Mary Weahkee (Santa Clara Pueblo/Comanche) and flute and whistle playing by Marlon Magdalena (Jemez Pueblo), whose instruments have been made of bird-bone. Magdalena will also speak at 1pm. MIAC is pleased to present a pottery making demo with renowned Pueblo potter Robert Tenorio of Santo Domingo (Kewa) Pueblo. 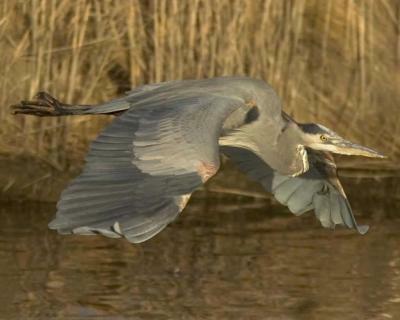 The Great Blue Heron is a familiar large bird and is the largest heron in North America. It is often seen either standing silently along inland rivers or lakes, or flying high above, its figure reminiscent of its dinosaur ancestors.